In this fast-paced world of today, the playing field has become highly competitive especially for companies catering to the same market. As a business or finance student, your goal is to gain the relevant skills necessary to help your future company (that is if you will become an entrepreneur) or the company you will work for, maintain relevancy and profit in the market arena. And that is why it is important to learn how to do ratio analysis with our company ratio analysis homework help. What Is a Company Ratio Analysis? In simple terms, a ratio analysis of financial statements is a quantitative method of finding information that is contained in a company’s financial records and using this information to determine the value of a company. Information is usually derived from sources such as cash flow statement, balance sheets, and income statements. This information is further used to determine the solvency, efficiency, profitability, and liquidity of a given company. Ratios are also used to compare different companies that are operating in the same market to see how they are faring on. Helps the company to bring more investments – It’s human nature to always play it safe. Even if your company is owned by the richest of richest, a matter of pride comes to play in not wanting to see your company slip and fall. And that is why investors and creditors are deemed an important part of a company. So how do these investors pump their money into a company that they see is necessary to invest in? They first check the report on financial ratio analysis of the company in question before investing in it. If the financial ratios are healthy (that is, they are above the stipulated industry benchmark), then investors will be more willing to direct their capital there. Beneficial for calculating the debt-to-equity ratio – The debt to equity ratio is very important for the growth and profitability of a business. In fact, when this ratio has been determined, then companies can be able to compare both their debt to equity and accurately assess their financial status. For example, if the ratio is low, then the company can confidently borrow money presently and in future situations. Determine the return on investment – For investors currently sitting on the board, the return of investment lets them know how much profit and how much money they are making with the company. Having a great ROI means that your investors will be satisfied and more open to directing capital for business expansion. There are different types of financial ratios but we will have a look at the following ones for further clarity. They will also help especially if you are doing a project on ratio analysis of a company. There are many types of investment-valuation ratios, but the most important one is the P/E ratio that compares a company’s current price of its shares to the total earnings that it generates. Find out how to find debt to equity ratio and what is the purpose of using this approach in finances! So now that we know the meaning of financial ratio analysis of company, let us have a look at two examples using these formulas. That being said, you can have a look at more examples of the given ratios once you get in touch with us. We also provide essential assistance on a financial ratio analysis project to help you understand the given ratios much better. Furthermore, essential writing guidance is given when it comes to your financial ratio analysis dissertation. 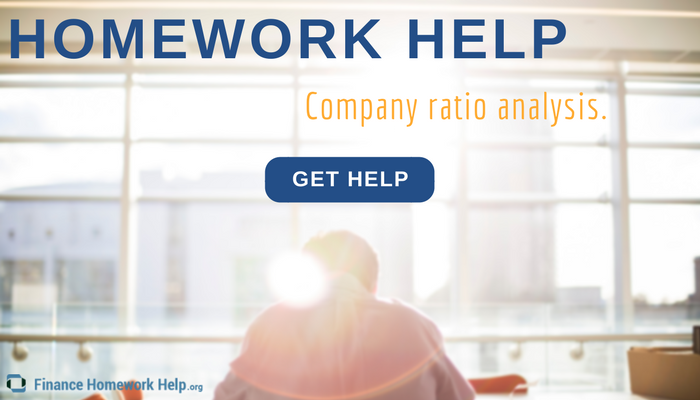 So get in touch with us for the essential company ratio analysis homework help and we will immediately assist you! ← How to Calculate Required Rate of Return?